What's new in Analysis Services 2016 (tabular model)? 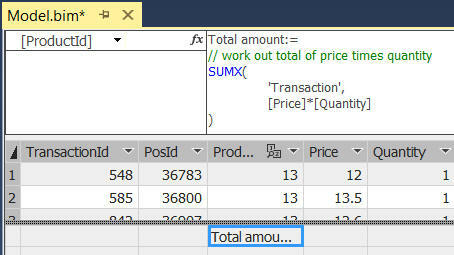 This page shows that it's now easier to create DAX formulae in Analysis Services. Be aware that many of the improvements will only be available if you are using SQL Server 2016 as your workspace server. So you're typing in a complicated formula, and you want to make it easier to read. You can now add comments and indentation! Comments begin with // and appear in green. There's so much to like about this! You can press Alt + Enter to insert blank lines. You can press the TAB key to indent lines. This is what the measure looks like AFTER you press the Enter key. The formula is missing a closing parenthesis, but SSAS will add this for you. One of the nightmares of the old DAX editor was making a mistake. Sometimes you'd be able to correct your formula, but often Visual Studio would create a phantom measure and lose your changes. Not only does the editor now underline in red the mistake you've made, but it also allows you to create an invalid formula. This single feature alone is worth the upgrade to the new version of Analysis Services Tabular! 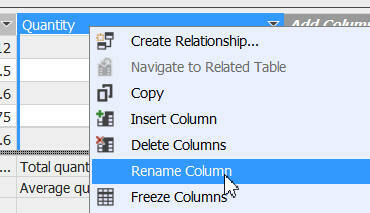 If you rename a column like this, what happens to measures using its name? 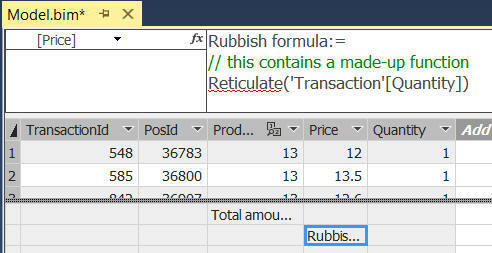 The formula for the measure shown has automatically changed to reflect the new column name. So now we can actually use the DAX editor effectively, what changes are there in the language itself?